It’s time for another Guest Dare – the November edition. For those new to the feature, our Guest Dare is a monthly endeavor in which we invite an unsuspecting victim to read a book totally outside of their comfort zone. You can read all previous Dare posts HERE. This month’s victim is the fabulous Rhiannon Hart – prolific blogger and aspiring author of Young Adult fantasy. Rhiannon’s reading tastes run towards the Dystopian and Apocalyptic (sound familiar? ), especially of the YA persuasion. When we contacted her for a guest dare, she came back with a laundry list of genres she’s uncomfortable towards, we (naturally) found a way to encompass multiple areas of discomfort in one book – a male protagonist, in a science fiction setting (minimal physics involved), with multiple war/thriller storylines. The book is The Warrior’s Apprentice by Lois McMaster Bujold, starring none other than the incomparable, indomitable Miles Vorkosigan. Ladies and gents, please give it up for Rhiannon! Why did we recommend this book: After discovering this series last year, Miles Vorkosigan has become one of Thea’s favorite protagonists. And when Rhiannon mentioned her aversion to scifi, male protagonists and war/espionage thrillers, we knew immediately that Miles and his shenanigans would be able to win her over. Thus, we recommended The Warrior’s Apprentice! Between the seemingly impossible tasks of living up to his warrior-father’s legend and surmounting his own physical limitations, Miles Vorkosigan faces some truly daunting challenges. Shortly after his arrival on Beta Colony, Miles unexpectedly finds himself the owner of an obsolete freighter and in more debt than he ever thought possible. Propelled by his manic “forward momentum,” the ever-inventive Miles creates a new identity for himself as the commander of his own mercenary fleet to obtain a lucrative cargo; a shipment of weapons destined for a dangerous warzone. Miles Vorkosigan has eleven generations of proud warriors preceding him, all weighing heavily on his stunted, fragile frame. His attempt to qualify for the Barrayaran Military Service Academy and follow in his illustrious family’s footsteps fails when he breaks both legs on an obstacle course. At a loss for what to do with himself now he’ll never become an officer, he turns his attention to Elena, the beautiful daughter of his bodyguard, Sergent Bothari, to help her found out the truth about her unknown mother. A chance meeting with a jump pilot about to have his ship scrapped on Beta colony sets in motion a series of events that sees Miles become the leader of a private, imaginary army, and embroiled in a war against the Oserans. From the very beginning of this novel I was fascinated by Miles. He’s the perfect combination of audacity, wit, ego and fragility. On a planet where defects are barely tolerated, Miles’s physical imperfection makes him even more determined to prove himself, especially to his father. His catchphrase “forward momentum” is an apt one, and combined with an overwhelming desire to help the underdog (who he is prone to identify with) he becomes embroiled in all manner of sticky situations. Outward he is austere and commanding; in private he is fraught with worry and prone to tears. I don’t know whether I want to clasp him motheringly to my breast or tongue pash him. I was relieved at how character-driven the narrative was. I’m not a sci-fi aficionado despite all the speculative fiction I read. I get a bit lost in deep space. I really like to know how things look and where they sit in relation to one another. The problem with space is it’s mostly empty (funny that) and I can’t get a proper handle on where things are. All the worm-holing and planet-hopping that went on had me a bit baffled, and see now why it may have been a good idea to read the two preceding books in this sequence, if only to learn more about Beta and Barrayar, what they look like and where they sit in relation to Earth. While I had a hard time visualising things, the social aspects and interplanetary relations were well fleshed out. I loved the contrast between the prudish and sheltered Barrayarans and the liberal Betans. Cordelia, Miles’s mother, is from Beta and also the protagonist of the first two novels, and her exasperation with Barrayarans his highly amusing. Overall, this is a very funny book. I had a huge grin plastered on my face the whole time I was reading it and frequently laughed out loud. Bujold is a true wit. It’s also very touching, exciting and believable. Bujold doesn’t try to tie things up too neatly. Characters with a sordid past are neither demonised nor exonerated. They just are. I will definitely be picking up the other books in this series and picking up more sci-fi in general. I think a lot of teenagers would get pleasure out of books like these, but no one seems to writing them for a mass audience at the moment. Perhaps I should try! I’ve heard whispers that after the wave of dystopian novels that is about to submerge us up to our necks in end-of-the-world scenarios (hurrah!) sci-fi will be the next big thing. I better start researching rocket fuel and air-locks. Thanks for having me, Smugglers! This was a fantastic dare, and maybe the start of a beautiful friendship between me and deep space sci-fi. There you have it, folks! Rhiannon is converted to the wonder that is science fiction and the awesomeness that is Miles Vorkosigan! Thanks again to Rhiannon for being a good sport, and for the fabulous review! I am currently working my way through the Sharing Knife series. As soon as I am done with that I intend to read this series. I used to be that way. When I was a kid, I wouldn’t touch anything sci-fi/space related. I read everything else I could get my hands on until, one day, I was out of things to read. I snuck into my brother’s room and, er, borrowed his copy of Heir to the Empire (a Star Wars novel). I can’t tell you how much I despised Star Wars before I read HttE. Afterwards, I watched the series on deathloop – for some reason it was on TBS non-top. I think I was converted to space opera because this was a very character oriented book. Now, I can get enough character oriented sci-fi. Thanks for sharing your great review here today. I love the Miles books. You are in for a treat as you read the series! I would suggest David Weber’s Honor Harrington novels as your next SF reads. And the late David Feintuch’s Nicholas Seafort short series. I’ve read & re-re-read those books. Great review! I do like SF but am far from being an expert in many of the authors. I have certainly heard of Lois McMaster-Bujold, but have yet to read any of her stories. Now I have a place to get started. Thanks, Rhiannon! I’m so glad you created another convert to Lois McMaster Bujold! I’d be down for a challenge. I will start this series soon. I will start this series soon. Great review, Rhiannon! I’m so glad you liked it. Oh I ADORE this series. I say that because I did start chronologically with Shards of Honor/Barrayar, and while I liked them well enough, I didn’t feel the *need* to run out and get the next book. Once I did get around to reading The Warrior’s Apprentice however, I pretty much visited every bookstore in the city until I had all the books in my hands. On the other hand, I’m not really the sort of reader who has to know where things are and how they fit together, so it may be a YMMV thing. My MIL is obsessed with this series. Please stop! My TBR pile is bursting! Li, you’re so right about the order. It’s like all these nutcases telling people to read Narnia starting with Magician’s nephew. No. Um, no. And also no. Sandy – I’m stoked that you made the switch over to sci-fi (and really, what better way than with the original star wars films and books!). I’m really trying to actively get more scifi in the review rotation here, so any suggestions are definitely welcome! Janicu – Awesome! Hope you enjoy it. Miles totally rules. Patricia – Miles Vorkosigan is a fine place to start and get acquainted with scifi and with Ms. Bujold. I hope you enjoy! Angie! You haven’t read Miles yet?!!? I swear that you had! Well, you really must get on board – because he is EXACTLY your cup o’ tea. Really. Listen to Li. You’ll love him, I know it! Li – It’s all because of you that I picked up the Miles books in the first place, and I started with The Warrior’s Apprentice as well without any problems! (Which is why I pointed Rhiannon to start there too :p ) So really, again, it’s all thanks to you! Diana – EXACTLY! You start your adventures in Narnia with The Lion, the Witch and the Wardrobe. No ifs ands or buts about it! Li & Thea, I know! I know…I’ve got to get serious about this one. So which one should I really start with? You know me. Where do I start? ::raises hand:: I’d be interested in a guest dare in 2010, ladies! Thanks for that wonderful review, Rhiannon. I’ve had this series on my radar for ages, because of the number of spec fic authors who cite it as one of their favorites. I’ve hesitated, because of my reticence about sci fi, esp “space opera” type stories. However, I’m currently working on it, by listening to Valor’s Choice by Tanya Huff (whose uf books I love). I’ve had Ethan of Athos wishlisted at Audible (MV #1) but will definitely look into changing that to Warrior’s Apprentice and move it up my list. Yeah to what Angie said. I’m confused. 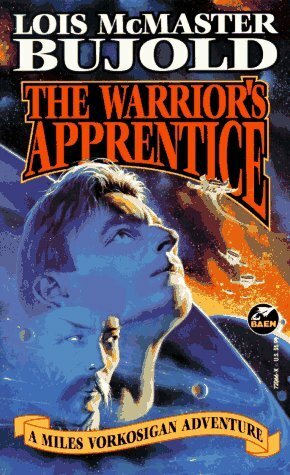 So Warrior’s Apprentice was written first, but then there were prequels? Diana – Yep, The Warrior’s Apprentice was published first and is the first book to introduce people to the star of the series, Miles Vorkosigan. BUT, there are four stories (two novels and two short stories/novellas) that are chronologically set before this book, and they deal with Miles’ parents. I’m not sure if the four stories were written before The Warrior’s Apprentice, but they were published afterwards. Thanks so much for having me Smugglers! It was so much fun reading it and I recommend the Miles books to you all. Cordelia’s Honor just arrived today (yay!) and I’m looking forward to hopping back in time to the beginning of the series. And then onto more Miles! Yeah, I think there’s a reason prequels are called that. They are meant to be read AFTER, you know? I completely echo Thea’s recommendation to start with The Warrior’s Apprentice. By way of evidence, I tried to start my sister off with Cordelia’s Honor (to make things even more confusing, this is the omnibus version with Shards of Honor AND Barrayar). Me: Tell me what you think! You loved it, right? Her: Nah, not really my thing. Me: You ungrateful brat! See if I ever lend you any other books. Her: Can I borrow some books pretty please? Her: So err… any more books in this series? Me: What series? Oh, you mean the one you didn’t really care for? That one? Her: Gimme. Now. All of them. So, a rather long-winded way of saying do start with The Warrior’s Apprentice. And Renee, DON’T start with Ethan because that’s more of a side-story. Miles is pretty young in this book. He gets even better as he ages/matures. Komarr is my favorite in this series because it’s where he finally meets the love of his life. If you read the whole series, make sure you don’t skip the short stories. Borders of Infinity is particularly good as an illustration of Miles’ cleverness.